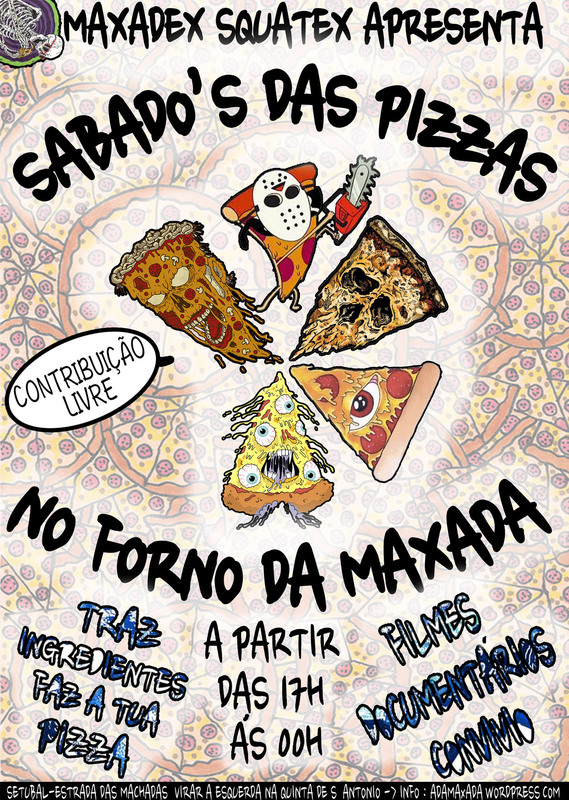 Queremos acender o forno todos os sábados e fazer pizzas e toda a comida que possa ficar mais saborosa ao cozinha-la neste belo forno a lenha,se tens interesse em fazer a tua própria comida num forno a lenha esta é a oportunidade ideal,vai funcionar por contribuição livre,precisamos de bastante lenha,farinha,levedura de padeiro e ingredientes para pizzas,temos preferência que os donativos sejam feitos nesta base em vez de donativos monetários. The idea is to light our outside oven Saturday evenings for everybody to make pizzas and all the food that is tastier being cooked in a wood-fired oven. The ideal opportunity to make your own bread, cake, and more, or to just have a nice pizza- evening. Oven-Use, home-made pizza-dough and some recycled ingredients are free on contribution, we prefer material donations instead of monetary ones. We need always firewood, flour, baker’s yeast to continue next time. Á da Maxada is a squatted farm in setúbal.With space for garden,music,arts,workshops,and all kind of diferent activities,always in a autonomous,anti-comercial and DIY perspective.